Hey @Adobe will you ever fix this preview bug? It's nearly a decade old now. My client: "Your pdfs make the “l” (el) look bold." Many people experience this issue, along with another good one -- seeing white lines within PDF files. Both of these screen artifacts (and they are just that -- screen artifacts -- they don't show up in print) are caused by the same culprit -- antialiasing. As I explained in this previous post, antialiasing is a double-edged sword. It solves some problems (gets rid of the jaggies), but it can also introduce other issues (on-screen artifacts). It's like any medication -- it aims to solve one thing, but often can introduce side effects. 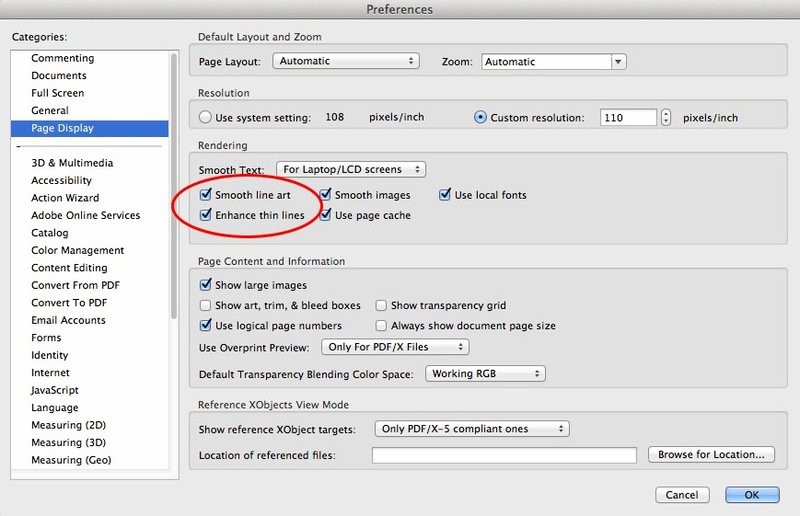 You can easily get rid of the side effects (the white lines and the fat lines) by disabling the specific antialiasing settings that introduce them -- directly in Adobe Acrobat Preferences. The two culprits in this case are Smooth Line Art and Enhance Thin Lines. If you have additional questions about either of these issues, don't hesitate to drop a comment into this post or the YouTube link. By the way, I didn't mention this in the video clip above, but it's POSSIBLE that you could see these white lines appear in print. How? OK, let's assume this scenario -- you create an ad in InDesign or Illustrator and create a PDF/X-1a file. This is a GOOD move on your part. Sending a validated PDF/X-1a file is the best way to submit files to someone else when they are going to print it. The assumption is that the person who receives your file will open the PDF in Acrobat (or place it into InDesign) and then print it from there. If that's the case, all is right in the world and your clients will sing your praises (although they will surely still only want to pay you barely minimum wage). HOWEVER, there are those (evil people) who will choose to open your PDF file in Photoshop. Perhaps because they think this is better. In that case, depending on how the file is saved from Photoshop, those white lines could get baked into the file itself (as once the file is in Photoshop, it's all converted to pixels). I've seen "smart" prepress operators think that due to the white lines they see in Acrobat, it's better to open the file in PS instead and then apply blurs or other effects to try and "get rid" of the white lines. This is silly behavior and can cause numerous other problems in the PDF (i.e. loss of spot colors, font hinting, etc). Bottom line -- if you have a PDF, print it from Acrobat or InDesign (or Illustrator). NOT from Photoshop. Your designers (and clients) will thank you. Mordy, Thanks for the explanation about the white lines appearing in the PDF. I have to convert print-ready PDFs to iPad versions. As I have outlines or paths in Photoshop (thus causing a flattening issue), when I flatten these layers in the PDF, I get a white line (just as you demonstrate). When I use your method to fix those white lines, I discover that text on other pages render poorly. Is there an alternate solution you can suggest? Thank you, Ted. There's too many bugs that have been there for years, its nice to see solutions for some of them. To take it a step further, I rasterized a PDF by opening it in Photoshop and turned off the "anti alias" option presented after choosing the pdf file. The white lines are gone in Photoshop now, which is huge for me since I often need to convert PDFs to JPGs. Without that anti-alias option turned off, the white lines WILL show up in print… they are there. I find it is better to convert PDF to JPG using Acrobat or InDesign. Personally, I prefer using the X-4 instead of X-1a since it doesn't flatten the transparencies. I rarely ever have a problem with X-4. However, when I do need to flatten transparencies for some reason, I use X-3. Using those two standards, we haven't had a single problem on any of our copiers, large format printers, or presses since we switched from X-1a back when CS4 came out. In Illustrator CC, select all of your outlined text, go to the top menu and choose OBJECT > PATH > ADD ANCHOR POINTS. Bomb solution! Tks for your help! Nice and easy. After upgrading to CC, I noticed that Photoshop is preserving the zero-width white lines from PDFs that use transparency effects. Fortunately, Macs let you keep previous versions of applications on your hard drive. When I open the PDFs in PS 5.5, the white lines are not there. That tells me it's a problem with Photoshop CC. For all you Windows folks since we dont have "enhance thin lines" option you can always use "Add anchor points" on objects -> path -> add anchor point. Thank you for this blog! I have spent hours today trying figure what was wrong with my art, .ai file, etc, because the created PDF file had extra thick strokes. Changing the one setting in the PDF corrected the display. I could not take comfort in "it will print just fine" as I cannot print a proof myself before sending to printer.